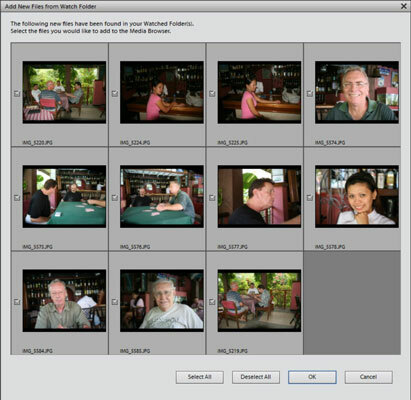 One easy way to get files into the Photoshop Elements Organizer window is to use Watch Folders. Watch Folders are folders that you can identify on your computer. Each time new photos are added to the Watch Folders, Elements prompts you to confirm adding the files from the folders to your Organizer Catalog. 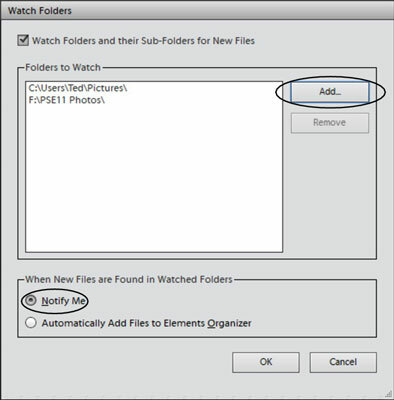 To set up a Watch Folder, open the Organizer and choose File→Watch Folders. The Watch Folders dialog box opens. By default, your Pictures folder on your hard drive is already identified as a Watch Folder. To identify a new Watch Folder, click the Add button. In the Browse For Folder dialog box that opens, locate a folder or make a new folder for adding photos. Each time you copy photos to any location shown in the Watch Folders dialog box, Elements sees the photos and either asks you whether you want to import them in your catalog or automatically adds the files to a catalog. In the Watch Folders dialog box, you find radio button choices for either notifying you when new files are found in a Watch Folder or for Elements to automatically import photos each time new files are added to a Watch Folder. Select the Notify Me radio button so that you’re always aware of when new files are added to your catalog. After you copy photos and launch the Organizer, a dialog box opens, prompting you to confirm adding photos (assuming that you chose Notify Me in the Watch Folders dialog box). Click Yes in the dialog box shown, and the Add New Files From Watch Folder dialog box opens. In the Add New Files From Watch Folder dialog box, you find thumbnail previews for the new files found in a Watch Folder. By default, all the check boxes are selected. You can deselect any photos you don’t want to add. Click OK, and the files are added to your catalog. When you add photos in the Organizer, only those photos you added appear in the Media Browser. To see all photos, be sure to click the Show All button at the top of the Media Browser pane.